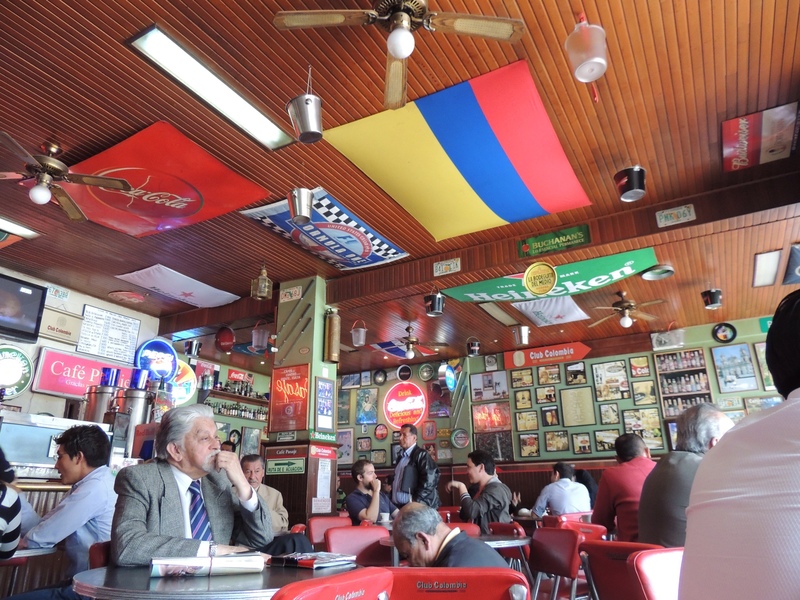 Café Pasaje, in Plazoleta del Rosario, retains a colourful Colombian atmosphere and, more importantly, cheap beer. Okay so I’m being a little self indulgent, but seriously, I met a fan! But more about that later. 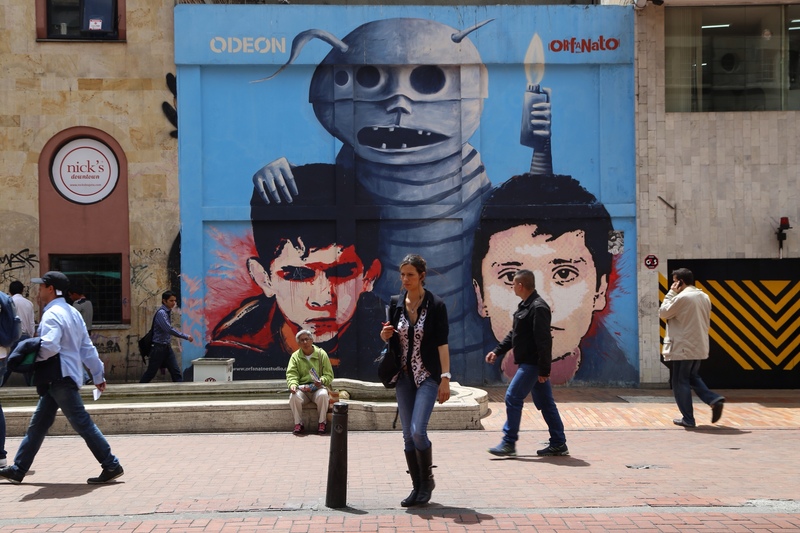 Bogotá also plays host to a range of impressive street art. Somewhat surprisingly, Bogotá doesn’t seem to feature highly on the Colombian gringo trail. The general response I got when I told people my next destination was, ‘Why are you going there?’ However, this isn’t to say that travellers don’t make it to Latin America’s eighth largest city and of course, the Colombian capital. There is no shortage of amenities for tourists either, with a concentration of backpacker-friendly hostels and cobbled, graffiti-decorated alleyways in the La Candelaria district which sits just east of a well signposted central sector served by the excellent metro system. A good friend of mine from high school (shout out for Rob Weetman!) had noticed that another of his friends was planning a trip to South America a few months beforehand. No doubt using the magic of Facebook, he had given Charlotte the link to the page and she had bombarded me with a few friendly emails. Three months later it turned out we were going to cross paths in Bogotá. There was no way my ego was going to let me miss the opportunity to meet a blog-reader from England, so we arranged to hang out. Luckily, neither of us turned out to be axe-wielding internet crazies as I walked around my hostel looking for ‘a girl I met on the internet’. The two Aussies tucking into a couple of Tamales. Cookie and Lauren, two Aussie girls fresh off the plane from the USA, had also decided to check out Bogotá for a few days and they also immediately fell victim to one of my two-day bursts of unnecessary enthusiasm. If these signs weren’t all good enough, I found out that the Colombian musician sleeping in the dorm bed below mine was named Jesús. Things were gonna be okay. 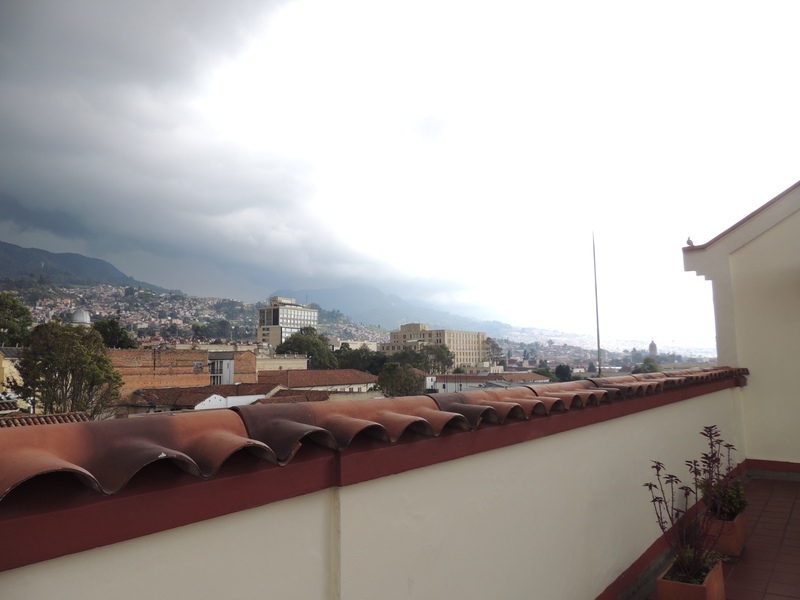 So, how did we break up a few days in Bogotá? 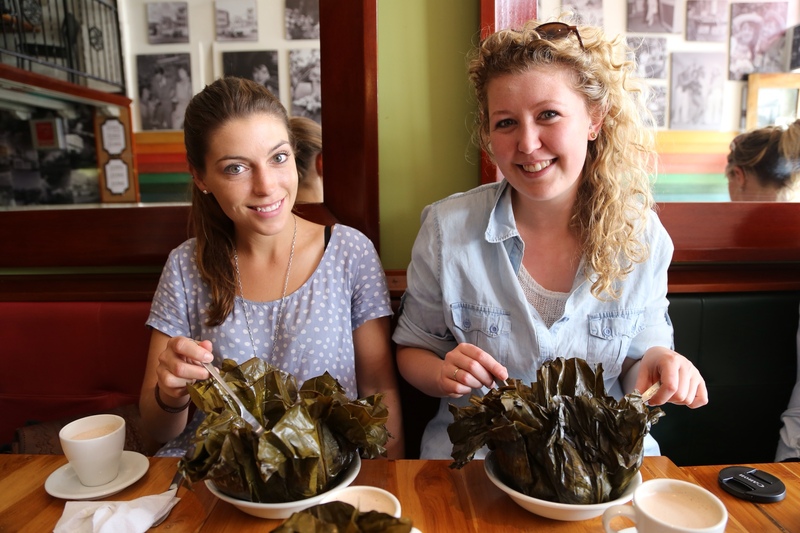 We began with a simple but effective backpacker plan: structure each of your days around food. My Footprint Handbook (insert another bible reference here) kindly solved a couple of searches for us, while we took recommendations from people around the hostel on what to stuff ourselves with next. I was pretty eager to test a theory put to me by a Colombian Couchsurfing friend from Cordoba who had told me that Colombians dunk their cheese into their hot chocolate, stir it around and then just, well, slurp it up. Panadería Florida (Cra. 7 No. 21-46) was one of those places that makes you feel homeless as a 9-month old backpacker, but I braved the public scrutiny of my facial scruff and it was worth every peso. Definitely the place to try chocolate santafereño. A philosophical, guitar-cradling Venezuelan guy (there’s one in every hostel) told us at length about his experiences with hallucinogenic Amazonian medicines, before absoutely insisting that we try Ajiaco, a delicious, thick, Colombian soup made with four different types of potato, corn, chicken and served with capers, sour cream and a spice called guasca, giving it a unique flavour. It took myself and the Aussies some searching, but it was well worth the 16,000CLP ($8AUD) price tag. Other, cheaper local eats included deep-fried empanadas, available on almost every street after 1pm with more sauces than flavours of filling, and Obleas, my favourite Colombian sweet: thin tortilla-sized waffle style wafers typically served with arequipe, chocolate, cheese and mora (raspberry jam). In between gorging ourselves we roamed the streets from our quiet district in La Candelaria, through rich colonial-style streets and tiny unique markets into the Plaza Bolivar, unsurprisingly overlooked by the Catedral. As I mentioned before, the central district of the city is extremely tourist-friendly, with signposts at each major corner pointing to major attractions and giving walking distances. We used this to our advantage and strolled over to the Museo del Oro, housing over 50,000 pieces of pre-Colombian gold displayed alongside fascinating historical and technical information. The curators have mixed history with art in one space, creating a diorama that fills a circular room and is brought to life with light and music. A grey view from the roof of the (underwhelming) Police Museum. The weather wasn’t kind enough to warrant a visit to Montserrate via cable car, the lower of the two eastern mountain peaks that accompany the city. Instead, I paid the price for hanging out with two girls and spent a little bit of extra time souvenir shopping, I shudder to think what Cookie’s backpack must weigh a few weeks later! The day before Cookie and Lauren made headway for Medellin, we took a two-hour (each way) day trip to Zipaquirá and it’s famous Salt Cathedral, which I will cover in the next post, In Pictures. Until then, enjoy the remaining photos from Colombia’s capital. ← Super Cali Took The Biscuit!